Ford will debut the all-new Edge at the Frankfurt Motor Show. Set to deliver optimised fuel efficiency and sub-150 g/km CO2 emissions when it goes into production later this year, the 'upscale' Edge - offering premium technology and refinement - will join the Ford Kuga medium-sized SUV and EcoSport compact SUV to meet the demands of growing numbers of SUV customers in Europe, says Ford. The Edge is Ford's large SUV, and will be offered in Europe with a choice of 180PS 2.0-litre TDCi diesel engine with six-speed manual transmission, or 210 PS bi-turbo 2.0-litre TDCi diesel with six-speed PowerShift automatic transmission. Both powertrains will deliver up to 78.4mpg fuel efficiency and 149g/km CO2 supported by Auto-Start-Stop technology. The Edge also will feature Ford's Intelligent All-Wheel Drive (AWD) technology as standard, delivering a 'seamless' transition between front-wheel drive and all-wheel drive performance. Measuring how the car's wheels are gripping the road surface every 16 milliseconds - twenty times quicker than it takes to blink - the system can send up to 100 per cent of engine torque to the front or rear wheels. By only delivering torque where and when it is needed, Intelligent AWD has minimal impact on fuel-efficiency and CO2 emissions compared with permanent four-wheel drive systems. The SUV will also offer new Ford technologies, including Adaptive Steering, which automatically optimises the steering response according to vehicle speed, making it easy to manoeuvre at low speeds, while remaining 'precise and intuitive' at higher speeds; and Front Split View Camera, which makes restricted visibility junctions or parking spaces easier to negotiate. The Edge introduces Pre-Collision Assist with Pedestrian Detection, a camera- and radar-based system that operates at speeds from 5mph to over 100mph to detect vehicles and people in the road ahead. The system can automatically apply the brakes if a potential collision is detected and the driver does not respond to warnings. Interior refinement is achieved via acoustic windscreen glass and laminated glass for the driver and front passenger door windows which help minimise noise in the cabin. Underbody panels and wheel well liners further minimise road and wind noise. All Edge models (except Zetec in UK) are also equipped with Ford's Active Noise Control technology that detects unwanted engine noise in the cabin and cancels it out with opposing sound waves that are fed through the car's sound system. Ford says the new car's interior has been designed to deliver a 'luxurious occupant experience' with high-quality materials throughout, including soft-touch trims on the dashboard and centre console, high-gloss piano black surrounds on the switch bezels and a satin silver metal finish for the door handles, air vent bezels, glovebox trim and steering wheel detailing while heated and cooled front seats and heated rear seats are also available. 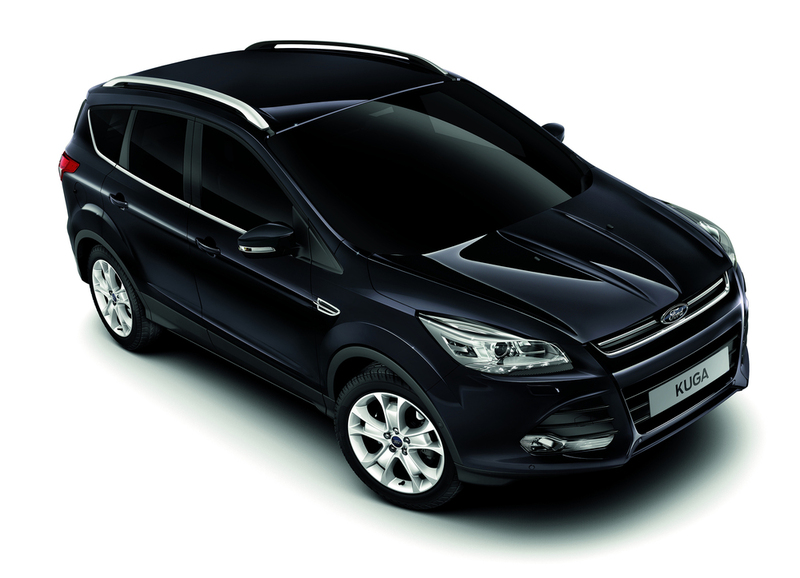 The Ford Kuga is also now available to order with new equipment including SYNC 2 connectivity with an 8-inch touchscreen, interior upgrades and new exterior colours. The Ford EcoSport is enhanced with styling upgrades, improved driving dynamics and new equipment for more comfort and convenience. "Spacious, refined and with athletic design, the all-new Ford Edge also delivers strong fuel efficiency and low CO2 supported by our most advanced diesel engines, Auto-Start-Stop and Intelligent All-Wheel Drive technology," said Roelant de Waard, vice president, Marketing, Sales and Service, Ford of Europe. "Consumer appetites for SUV and all-wheel drive vehicles like our new Edge are so strong that we plan to introduce five new vehicles in the next three years that will compete in the SUV and crossover space."